Yosemite National Park contains some of the world's most iconic landforms, including Half Dome, Yosemite Falls, and El Capitan. Although the cliffs of Yosemite Valley may appear static, rockfalls from these cliffs are common, with a rockfall occurring every four to five days on average. Rockfalls are key to shaping this iconic landscape but also pose risk to the four- to five-million visitors to the park annually. 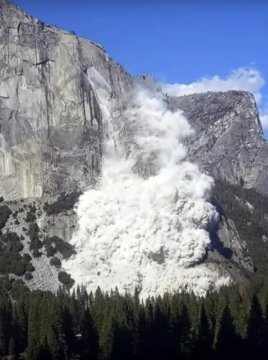 Using new "structure-from-motion" photogrammetry techniques in conjunction with baseline laser-scanning data, scientists from the NPS, the U.S. Geological Survey, and the University of Lausanne, Switzerland rapidly analyzed these rockfalls. By comparing 3-dimensional (3D) models of the cliff before, during, and after the rockfalls, the researchers were able to pinpoint the exact locations, dimensions, and volumes of the rockfalls, along with the spatial and temporal pattern of their progression up the cliff.